Funded by the Regional Council of Governments (SACOG), a new roundabout in downtown Olivehurst is in its final stage of completion. Mary Jane Griego, as (then) Yuba County Supervisor, sat on the SACOG board and drove this $710,000 project. Located at the intersection of Olivehurst Avenue and Powerline Road in Olivehurst, the project should wrap up soon--I noticed that overhead street lights are being installed. I remember coming to live and work in South Yuba County in 2004, and I recall seeing an area sadly in need of a facelift. There were many old, abandoned buildings and other unsightly structures along this part of Olivehurst Avenue. Most of those old dilapidated structures are gone now; replaced by new retail businesses as the area has experienced some rejuvenation. Most notable are the new Rite Aid and H&R Block businesses that are visible as you enter Olivehurst Avenue, coming off Highway 70. As important as the beautification of the commercial area of Olivehurst is, the new roundabout is much more than just a pretty face. With several roads coming together at this intersection in a very disjointed fashion, it has been a dangerous junction. 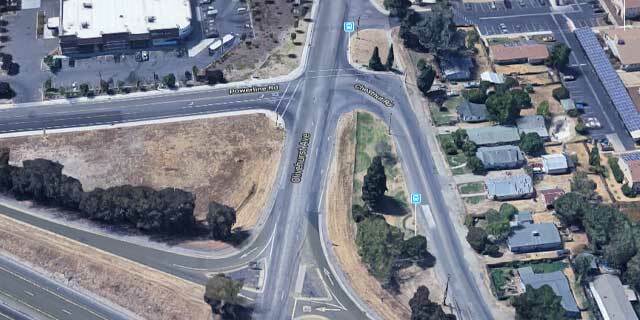 Looking at Google’s Aerial view of the intersection before roundabout, it’s not hard to see why drivers were often confused, and accidents were common. In fact, local merchants have stated that it seemed there was an accident nearly every day before the roundabout was built. Since the roundabout became usable, that has not been the case. The new roundabout alleviates the former confusion and creates an intersection that is both functional and safe for drivers, bicyclists and pedestrians alike. But, since they are not common in our area, some drivers aren’t sure how to drive through them. Here is a great article by Rachel Rosenbaum in the Appeal Democrat to help you learn to navigate them: Public Safety: How to drive through roundabouts. As I see it, beautification and public safety are combined and enhanced by this project. So before passing judgment, I invite all naysayers to drive it. Yes, it may take a few times to get used to it, but I am confident you will ultimately appreciate its benefit as both a visual and safety improvement for the Olivehurst community. In my opinion, that’s a win all around. I have been very actively involved as a leader of local support for Enterprise Rancheria’s casino in South Yuba County for about 10 years. Over the years, the project has begun movement forward, only to face legal challenges from other casinos—joined by local politicians—looking to stop the project. And stop they have. Contrary to what you might initially think, their efforts against this project were not a demonstration of the opposition’s moral high ground. Instead, it has been about stopping competition for the public’s interest in gambling and entertainment in the region. Those opposed to having a major new competitor have been nearby casinos and the public officials who have taken significant pay from them for help in blocking the project. This project will be one of the two biggest economic booms for this Region (the other being Yuba Water Agency getting millions formerly going to PG&E). With nearly 1,000 acres that wrap around this project planned as a major entertainment center (details are not yet announced), as this project continues to develop, it will vastly expand local opportunities in Yuba County. During its development, the Hard Rock Fire Mountain Casino will initially create thousands of construction jobs, as the project continues to grow and the surrounding land is developed, thousands of permanent jobs will naturally become available as well. Anticipation is high for a much needed upswing in the quality of life for residents in the region, with more entertainment options as well as support businesses of of all kinds moving to the area. Pay attention… this will be a huge economic driver for the entire Yuba-Sutter Region. Check my blog at www.jptaylorccim.com/blog regularly for developing details and updates on this important project.